Well, finally I went to buy some boxes to store my Lemon Kitscharms inventory! Previously it was all in plastic bags, ziplock bags and multiple containers all around my room and it was so messy and hard to clean the room. I bought 3 new cardboard boxes at $2 each to organise my stuff and make them look more cohesive lol. Tempted to paint the boxes too. I originally wanted to stack them but my charms weigh too much and the bottom might cave out so max 3 per stack, heaviest on the bottom. I still need 5 more because that is just half of my stash but it's such a drag to carry them home (bulky does not translate well in train rides)! Transparent box on the right is new also, and nice quality. It contains prepacked beads so I can grab them easy. 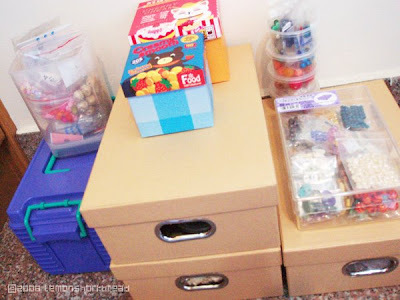 Cute cartoon boxes are my sorting boxes (like 'take photo box' and 'upload to shop' box). The purple box is stuffed with more beads and the corner left one is not-for-sale supplies! Yay for storage! I just bought a huge new sorting box too, it's fantastic!